Now this is some interesting news, Wataniya Airways has signed a code-sharing program with Austrian Airlines to expand their services, that is a great step forward for them. 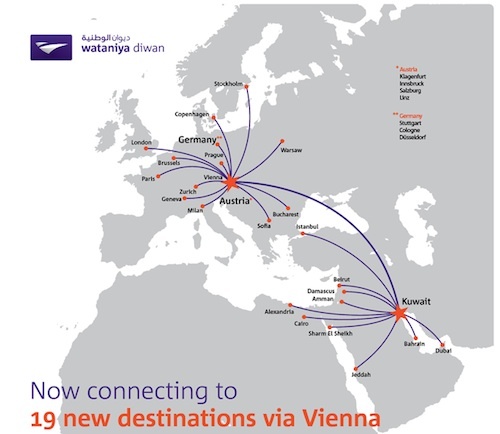 They are now opening 19 new European destinations for very cheap rates London for 99 KD, Milan for 122 KD. Its good that Wataniya Airways is expanding at a gradual rate and being smart about it, I just hope they stay in their current location in Sheikh Saad Airport but I don’t think that the airport is enough for their flights at this point. Then there is also the idea now that Wataniya Airlines might join the Star Alliance since Austrian Airlines is owned partly by Lufthansa, well its a possibility at least.